So last night’s trail ride was pretty eventful. We ran into a mountain lion on the trail, solo, without a gun or any extras. I guess I had severe false security, in that we were on the ranch property, and stayed somewhat in view of the house (super far still.) That and mountain lion viewings are super rare. I just wonder how many times we rode past this cat before seeing it. The other day we worked out a muscle building routine, and we were working on that- it involves loops up a few portions of hilly trails, and we had already done each loop once. Well on the second lap, we were trotting up our one path when Cello had a bit more energy out of nowhere. He didn’t do anything, just perked up a bit extra and I didn’t think anything of it. Until about 35 yards (I’m thinking in football field terms) ahead I saw a rottweiler-sized mountain lion run away. I definitely broke into a cold sweat before my brain 100% registered the image. I stopped Cello, who didn’t bat an eye, and we turned down the trail. The mountain lion had run away, so that was a good sign, right? Could we canter/gallop/freak out and get away without catching attention? Nope. I was pondering the quick escape as we went down the steeper part of the trail. I let Cello be in control and was twisted around in the saddle watching where we’d been. The mountain lion came back, and sat at the top of the rise we were going down. And watched. And watched. And I watched it. And Cello just kept going like no big deal. I can’t believe Cello didn’t spook, or act up in any way. He just registered it like it was a deer, or other grazing-non-threatening species, and stayed a bit calmer than me. He was all about getting away from it when I asked, but not in an unsafe way. It was also awesome that I didn’t have to steer or really worry about a spook- he got us back to the house, and I watched our back. Such a sensible horse! Cello and I both felt better after this ride. I am really surprised at how emotionally charged things are when I’m working with him. I definitely have to watch it- I’ve never been so caught up about workout-by-workout outcomes. I guess it’s just always been more… clinical, even with my last Thoroughbred. If we had a not so great day back then, it wasn’t a big deal. If that happens with Cello, I obsess over it! Part of it might be the long hiatus I had from horses. I’m way more focused and way more intent I suppose. We need to get some basics re-nailed down. This week the “testing” is on tying, standing still, and bitting. I’ve been able to get everything done without an ordeal, but it’s been a little more trying. He also was not to happy with me catching him yesterday, though it was dinner time and he had had a few days with the herd without me (herd attachment happens quick with him, if I miss a day or two he’s a little reluctant to come in.) After last night’s ride he stood next to me nice, got a neck massage, relaxed, and seemed concerned when I left the herd to get to my car. He never did that before- when it was time for me to leave, he just watched me and shrugged. This time he followed me to the gate, and was focused on me until I left. 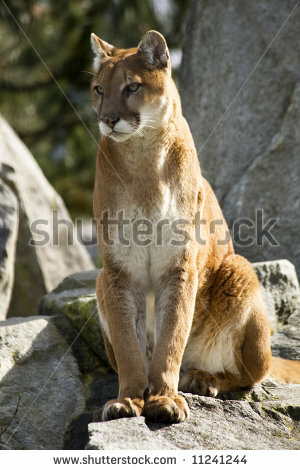 That’s it for the horse part, so back to the mountain lions.. The owner’s wife told me the mountain lion sightings are so rare that she, in 13 years of living here on a ranch, hasn’t seen one. Neither has Spencer. The neighbors had one chase a deer across their patio when they were eating dinner once, but that was it for the ranch sightings. My first year here I saw one on a dirt road at 3 in the afternoon, on my way to another ranch, where the owner who had been there for 20 years never saw one (though a client has seen probably the same cat at the same spot around the same time a few days earlier.) End of summer my landlord and I watched 3 (a very odd number for a relatively solitary animal) walk up the mountain across from our house in the afternoon, and that was the day after a mountain lion killed a deer in the middle of the day in the middle of the road in the neighborhood next to my house. One was screaming under our window in the middle of the night about 2 months ago, scaring the crap out of me and my husband. So Dana (Spencer’s wife) thinks it’s my spirit animal- if so, according to Native American lore, it shouldn’t ever be a danger to me!! Hahaha here’s to hoping since I’m out in the wilderness so much! This entry was posted in Training Philosophy, Trust and tagged Blm mustang, Cello, colorado, Dani Neumann, Extreme Mustang Makeover, mountain lion, trail ride. Bookmark the permalink.